Fresh Look (formerly Sears) Carpet & Upholstery Cleaning understands that your Oriental or Persian area rugs can be a major investment similar to a work of art that appreciates in value with proper care and protection. Fresh Look Carpet & Upholstery Cleaning experience and know-how will help to protect your investment for the long term. Fresh Look will correct stains, soiling and other damage and we can further protect your investment by expertly deodorizing and applying stain guard protection. We specialize in cleaning and protecting delicate wool and silk Persian, Indian, Chinese, and other Oriental carpets based on their specific weaves, fibres, and dyes. Our work is 100% guaranteed and your rugs are fully insured while in Fresh Look Carpet & Upholstery Cleaning possession. 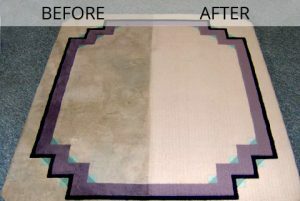 Rug badgering to remove soil that is deeply embedded in your rug which vacuuming alone cannot remove. The Rug Badger® gently beats the back of the rug and removes an amazing amount of sand and grit from your rug.